Vijayadasami also known as Dussehra, is an important Hindu festival celebrated in a variety of ways in India and Nepal. “Dussehra” is derived from Sanskrit; Dasha-hara is a form ofDashanan ravan. The day marks the victory of Durga over the demon Mahishasura. Navratri, culminating with Dussehra, is a cultural festival of great importance and significance for all. It is a festival that is all about the goddess. In Karnataka, Dussehra is about Chamundi, in Bengal it is about Durga. Like this, it is about various goddesses in different places, but essentially it is about the feminine goddess or the feminine divinity. Vijayadashami is celebrated on the tenth day of brighter fortnight the month of Ashwin according to the Hindu calendar. The first nine days are celebrated as Navratri, culminating on the tenth day as Dussehra. Since the harvest season begins in India and Nepal at this time, the Durga is invoked by religious rituals to begin the harvest season and renew the fertility of the soil. Many Hindus observe the festival with social gatherings and food offerings to the gods at home and in temples throughout India and Nepal. The following historical and scriptural records vindicate the fact that Dasara is a ‘festival of celebration of victory’ – of good over evil. Supreme Goddess Durga killed Mahishasura, a buffalo demon, during Navaratri. Mahishasura was killed after a continuous fight between goddess Durga and the dreaded demon for nine days and nights. Hence Dasara is celebrated in memory of this great incident. It marks the victory of Mahishasuramardini, and the defeat of evil. Another story from the great epic Mahabharata also refers to the celebration of Dasara. As per the legend, the Pandavas kept their arms and armor in a large hole of a Shami tree before embarking on Agnyatawasa, an exile in disguise. During Agnyatawasa they were living in the kingdom of Virata. On suspicion, the Kauravas had stolen the cattle of Virata to trap the Pandavas. It is believed on this day the Pandavas appeared with their weapons and defeated the Kauravas. 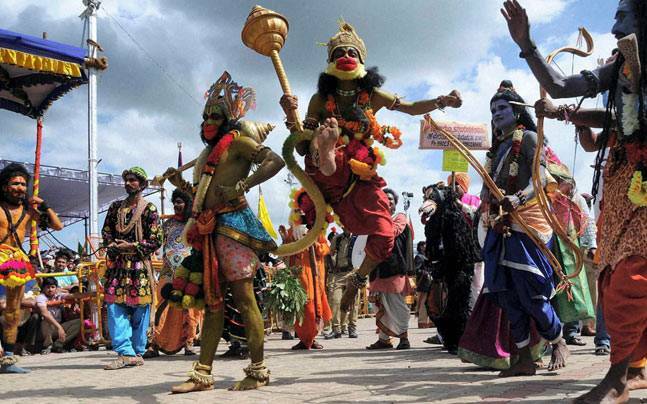 On the day of Dasara, the Pandavas revealed their true identity after living for a year incognito. This marked their preparation for the victorious war of Kurukshetra. Dasara is also famous for the victory of Lord Rama over Ravana. Rama along with his brother Lakshmana, his devotee Hanuman and an army of monkeys fought a great battle for ten days to rescue Sita. On the day of Dasara or Vijayadashami Rama killed Ravana, the king of Lanka. It is said that Lord Rama had performed a ‘Chandi Sacrifice’ to invoke the Supreme Goddess Durga during Navaratri. It was only because of Maa Durga’s blessings that Rama could defeat Ravana. It is simultaneously believed that after the victory, before proceeding to Ayodhya, Lord Rama worshipped a Shami tree. This victory of Rama over Ravana is mentioned in all the scriptures involving Lord Rama such as Valmiki’s Ramayana, Kalidasa’s Raghuvansham and Tulsidas’s Ram Charit Manas. Another story related to the festival is based on a young Brahmin named Kautsa who lived in the city of Paithan. After finishing his education with Sage Varatantu, he insisted that his guru accept Guru Dakshina. But, the sage was happy imparting knowledge to his disciples for free, and was adamant on not accepting any sort of Guru Dakshina. One day Kautsa greatly insisted the sage ask for Guru Dakshina. Out of a sense of duty, Varatantu asked him to give him 140 million gold coins, 10 million for each of the 14 sciences he had taught him. Following this Kautsa went to King Raghu. Raghu was an ancestor of Lord Rama and was revered for his generosity. But, just before Kautsa approached him for the wealth, King Raghu had performed the ‘Vishvajita sacrifice’ and donated all his money to the Brahmins. So, King Raghu requested the gold coins from Indra, Indra called Kubera, the god of wealth, and asked him to shower gold coins on the Shami and Apta trees around king Raghu’s Kingdom. King Raghu gave all the coins to Kautsa who took only the required 140 million coins. King Raghu distributed the remaining gold coins to his subjects. To mark this event, Hindus gift the leaves of Apta to each other as a symbol of gold on Dasara. In North India, Vijaya Dasami is celebrated as Ramlila. On this day, large effigies of Ravana, his brother Kumbhakarna and his son Meghnath are burnt in huge fairs in front of large crowds of spectators. These effigies are filled with different types of fire crackers and theatres are held depicting the story of how Lord Rama achieved victory over Ravana on this day. In Southern India, this day marks the end of Golu—a festival celebrated in Tamil Nadu, Karnataka and Kerala. Goddess Durga is worshipped in the form of Devi Chamundeshwari during this phase.